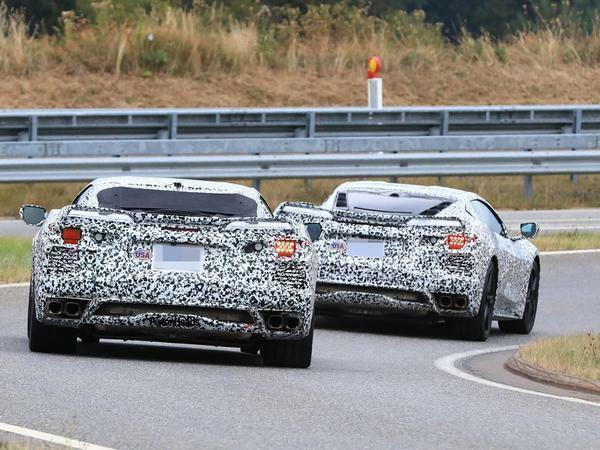 Home > Regulars > PH Spyshots > Corvette C8 confirmed for July reveal: Update! 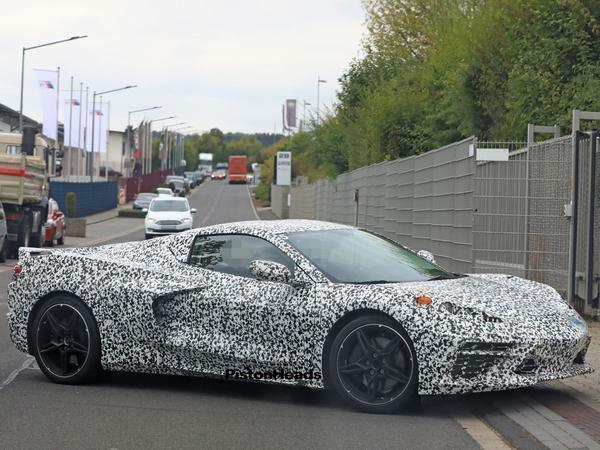 If the ongoing test car sightings weren’t enough of a hint at its impending arrival, Chevrolet has now confirmed that the hotly-anticipated Corvette C8 is due for reveal on July 18th. 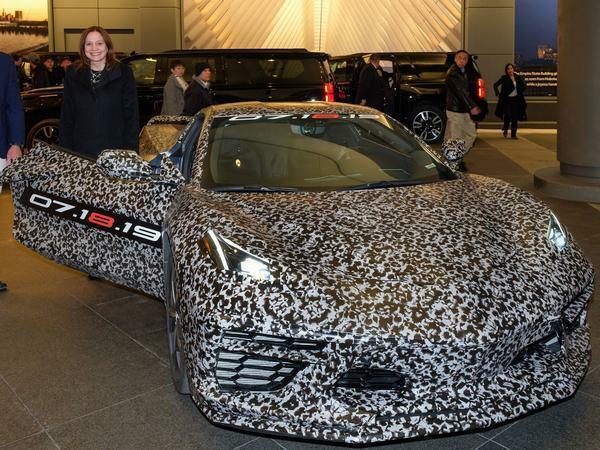 To rouse excitement in the build-up to its most drastically altered Corvette yet, company CEO Mary Barra took one of the mid-engined prototypes for a drive around New York before arriving at a busy ex-service members charity gala. 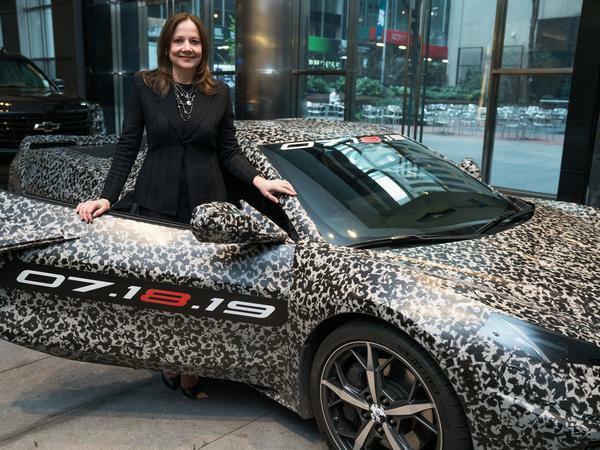 The official new date quells suggestion that the C8 was going to be revealed at next week’s New York motor show, although the prototype’s arrival in NYC suggests it will be on display there with its camo wrap. 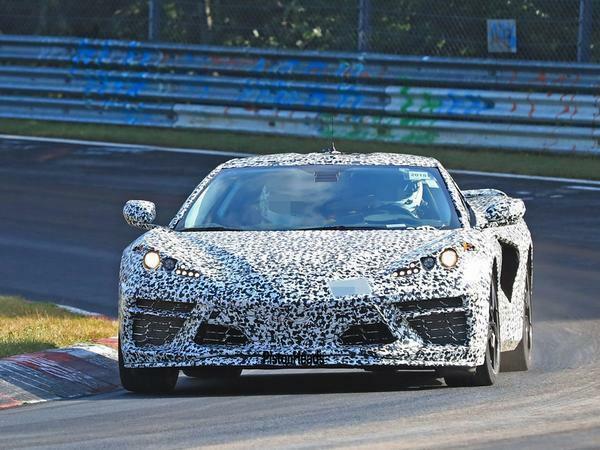 We’ve seen it and other C8s plenty of times before, of course, and even caught a glimpse of the new interior – so the longer, mid-ship body shape is already familiar. 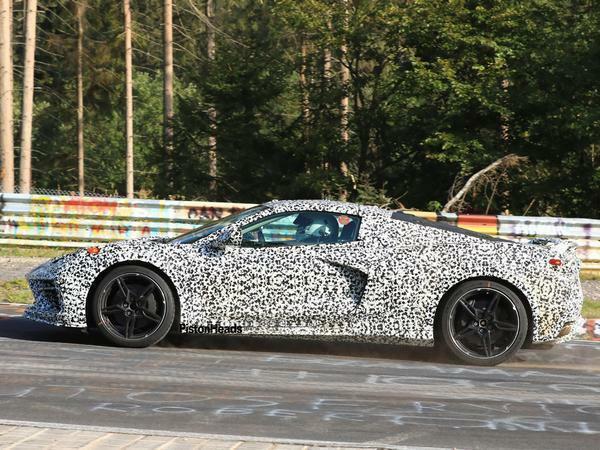 But with the engine mounted behind the cabin for the first time and power ramped up to as high as 850hp in a rumoured electrified V8 range-topper, the C8 will eschew tradition and as such is expected to create Chevrolet’s most serious rival yet for cars of the supercar establishment. 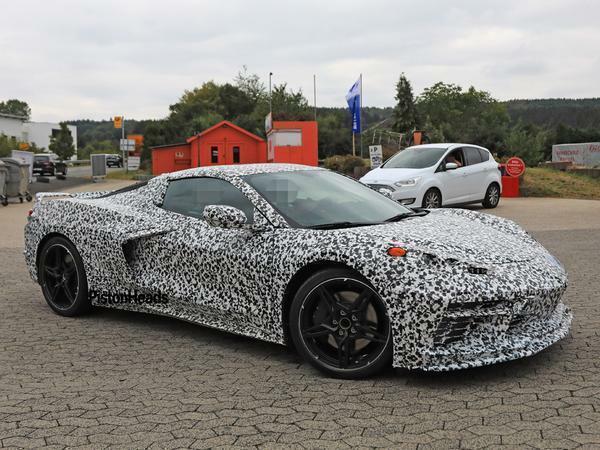 If you had any doubts of the inclusion of a good ol' (well, newly developed) V8 engine in the next Chevrolet Corvette, listen to the vocal chords of a recently spotted test car in the video below. Hear that? Yep, those are eight glorious cylinders being called into explosive action to charge this mid-engined supercar around the Nurburgring. It's Labor Day (yes, without a u) in the United States, but despite the bank holiday the employees of Chevrolet's European technical centre are hard at work. 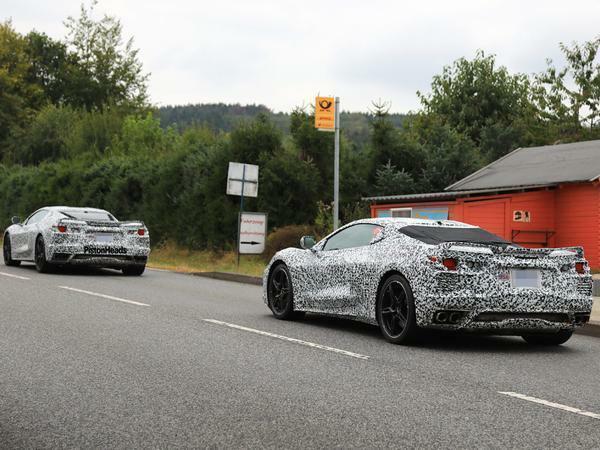 Not only have they taken delivery of a significantly less camouflaged iteration of the upcoming mid-engined C8 Corvette than we've previously seen, but they've been kind enough to take it out and about for us to have a look at too. 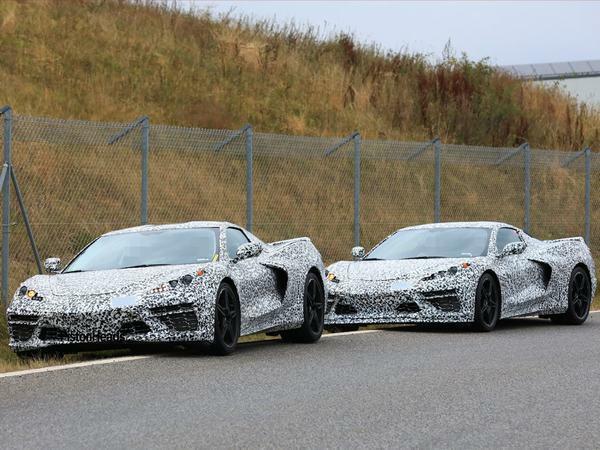 Thanks to that reduction in obfuscating addenda we can now more clearly make out that the new car retains a similar front end to the current C7 generation ZR1. 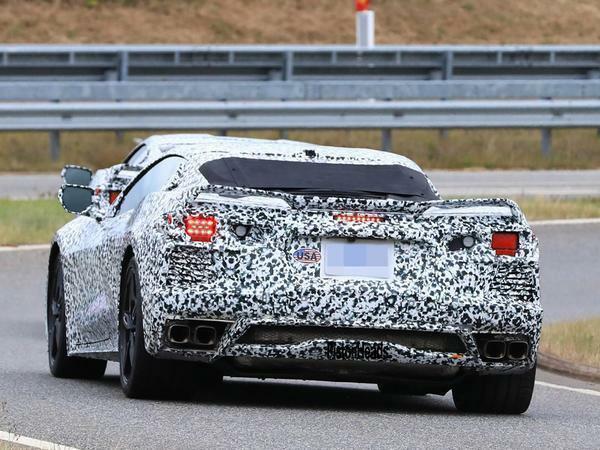 From there back, however, things are understandably rather different, with a shorter bonnet and longer rear deck leading into a squarer, seemingly Camaro-inspired tail end. The flared nostrils, prominent side intakes, and large vents below the rear lights all hint at the suspected increase in power set to come with the new layout, as do the quad exhausts. Exactly what forms the engines destined for that mid-mounted bay will take remains open for speculation. 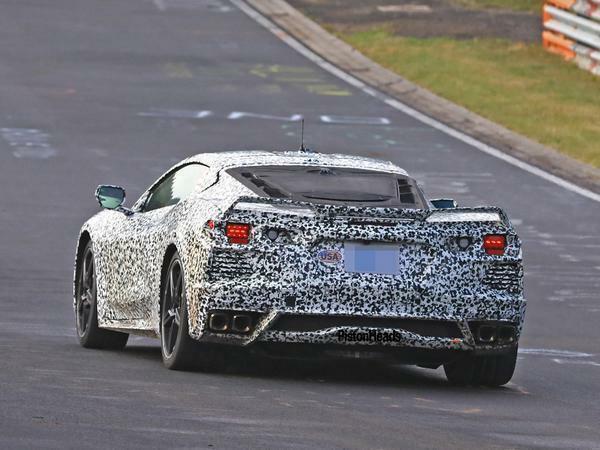 What is likely, though, is that they'll mostly be of the V8 variety with everything from naturally aspirated to hybrid-assisted turbocharged units being mooted, and outputs of 450hp all the way through to a whopping 850hp rumoured. 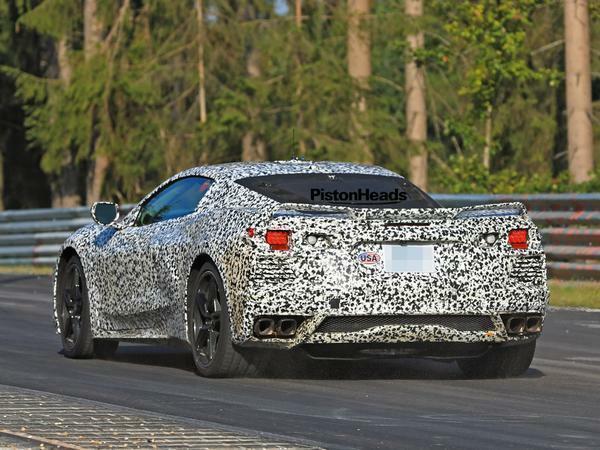 Below that comes the potential for an entry level V6, keeping the Corvette somewhat grounded as it leaves the niche of cheap but cheerful alternative to expensive European exotics - one which it has occupied with varying degrees of success for the past few decades - behind. Have they just stolen a Ferrari 360 front end? 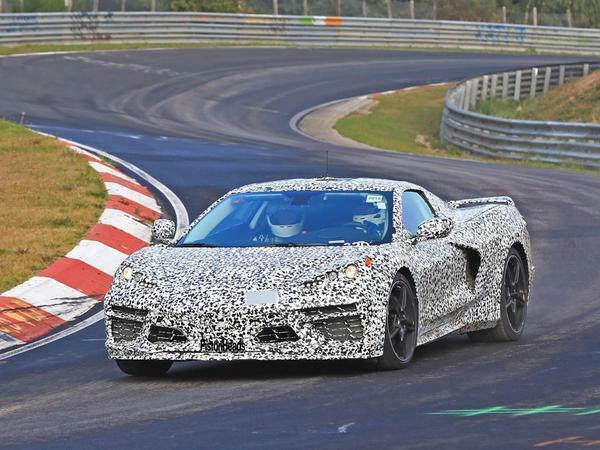 Why does Chevrolet need to make the iconic Corvette mid engine? Well set up front engine has near same weight distribution as a mid engine, their performance on racetrack confirms this. Is it to make the brand more aligned with the exotic Italian rivals that are mainly mid engined? 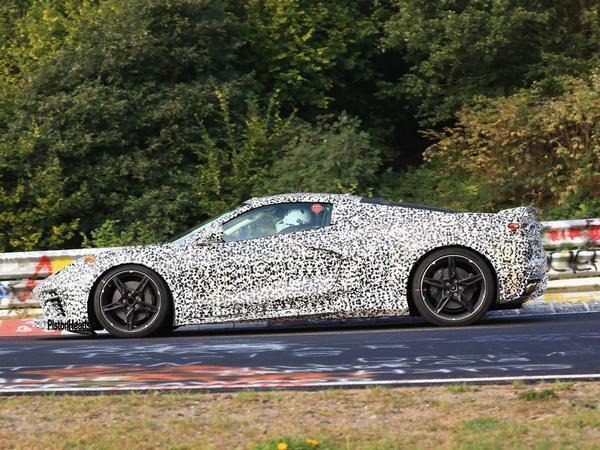 There's a general expectation that GM will keep the front-engine C7 Corvette in production and launch this mid-engine version this time next year as the more expensive halo car. 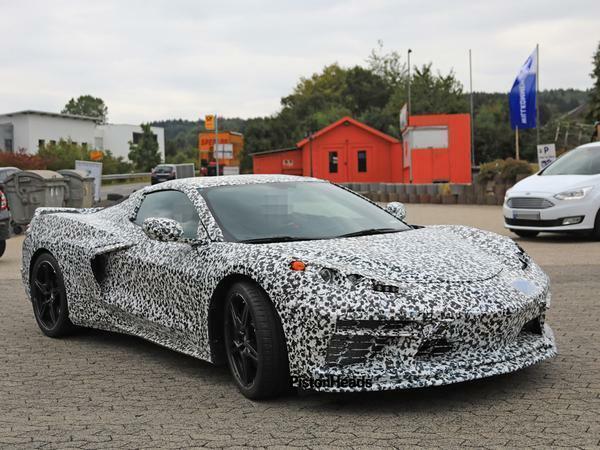 Existing C7, introduced as a clean sheet design four years ago, would then get a mid life update in 2020. 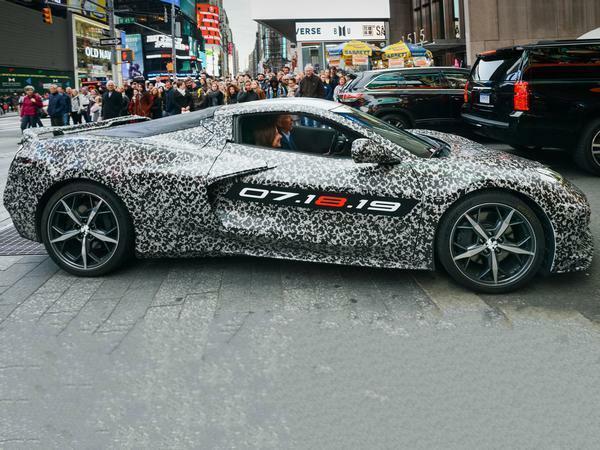 C7 has been very successful with production exceeding 40,000 cars a year. It's a stunning car and an absolute bargain from £65k in UK..
Pistonheads have some cheek, branding these images with their logo, when I'm sure they'll have picked them up for nothing elsewhere.